Lottery News: $1.6 BILLION JACKPOT - WHAT COULD YOU BUY? 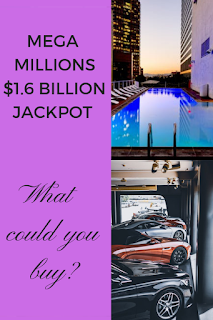 $1.6 BILLION JACKPOT - WHAT COULD YOU BUY? If you won enough money to be one of the richest people in the world, what could you spend it on? Not practically of course, but if you wanted to buy some outrageous things and just make a point of showing exactly how rich you are. We've listed some absolutely unnecessary things that you would now be able to afford. Read more about What You Could Buy here.